Recognize avalanche paths and estimate the angle of steep slopes above your route. Recognize a variety of terrain features and how they affect avalanche safety. Identify features that are potential Terrain Traps in the event of an avalanche. Know which areas of an avalanche slope are possible Trigger Points. Learn how a slope’s aspect to Sun and Wind can influence snow stability. Parks Canada has developed a terrain rating system that evaluates the complexity of avalanche terrain and makes recommendations on the suitability of avalanche terrain for various users. 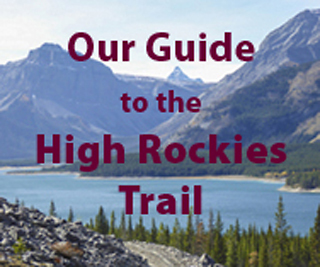 A major strength of the rating system is that the majority of backcountry destinations in Canada’s National Parks and in Kananaskis Country have been rated, and lists of rated trips have been made available to the public. Waterfall ice climbs have also been rated for exposure to avalanches from above or on the approach. The terrain rating covers specific backcountry trips. It does not rate individual slopes. It also assumes that backcountry tourers stay on the route used in the rating. Heading up a slope to get in some turns will negate the rating. The terrain ratings, Simple, Challenging and Complex, are geared to less-experienced backcountry tourers and organized groups such as outdoors clubs. The more detailed rating worksheet is a useful tool for more experienced and ambitious backcountry users to evaluate terrain for themselves. It is also used as a key component of the Avaluator, a trip planning tool developed by the Canadian Avalanche Association for backcountry enthusiasts with little experience of avalanche terrain. Exposure to low angle or primarily forested terrain. Some forest openings may involve the runout zones of infrequent avalanches. Many options to reduce or eliminate exposure. No glacier travel. Simple terrain requires basic winter travel skills and the discipline to respect avalanche warnings. Simple terrain is usually low avalanche risk. Ideal for novices gaining backcountry experience. However, these trips may not be entirely free from avalanche hazards, and on days when the public avalanche advisory is rated “Poor” you may want to re-think any backcountry travel that has exposure to avalanches — stick to groomed cross-country trails, or stay within the boundaries of a ski resort. Exposure to well-defined avalanche paths, starting zones or terrain traps; options exist to reduce or eliminate exposure with careful routefinding. Glacier travel is straightforward but crevasse hazards may exist. Challenging terrain requires skills to recognize and avoid avalanche-prone terrain — big slopes may exist on these trips. You must also know how to understand the public avalanche advisory, perform avalanche self rescue and basic first aid, and be confident in your routefinding skills. You should take an avalanche course before travelling in this type of terrain. If you are unsure of your own, or your group’s ability to navigate through avalanche terrain, consider hiring a certified guide. Challenging terrain. Photo Leon Kubbernus. Exposure to multiple, overlapping avalanche paths or large expanses of steep, open terrain; multiple avalanche starting zones and terrain traps below; minimal options to reduce exposure. Complicated glacier travel with extensive crevasse bands or icefalls. Complex terrain demands a strong group with years of critical decision-making experience in avalanche terrain. There may be no safe options on these trips, forcing exposure to big slopes. A recommended minimum is that you, or someone in your group, should have taken an advanced-level avalanche course and have several years of backcountry experience. Check the public avalanche advisory regularly, and ensure everyone in your group is up for the task and aware of the risk. This is serious country — not a place to consider unless you’re confident in the skills of your group. If you are uncertain, consider hiring a certified guide.